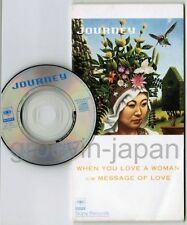 Journey - When You Love A Woman/Message Of Love CD Single NEW! 45RPM, CRESTS ' JOURNEY OF LOVE ' EXC ' RB DOOWOP GP. L.I.V. "JOURNEY OF LOVE" 12" 4 MIXES EXC!! ROCK & ROLL 45 RPM - JEANNIE & JANIE - CAPITOL 4396 - "JOURNEY OF LOVE"